The EVGA X299 Micro uses an all black 8-layer PCB, and goes without any design aesthetic stenciled on it. All the slots and all the ports, including the four memory slots, the three non-reinforced PCIe slots, the SATA ports, the chipset heatsink, and even the EPS/ATX 12V connectors are black, matching the color style of the board. The shroud for the back panel IO does not come pre-attached to the board, and requires the user to attach it - this is likely to save on additional manufacturing cost, but allows the user to also install the Wi-Fi module that is included but not automatically installed (EVGA might sell the board to an OEM without the Wi-Fi?). Both the rear panel shroud and the VRM heatsink share the same design with a plastic, almost cobblestone-like, pattern weaving its way around the shroud and heatsink. 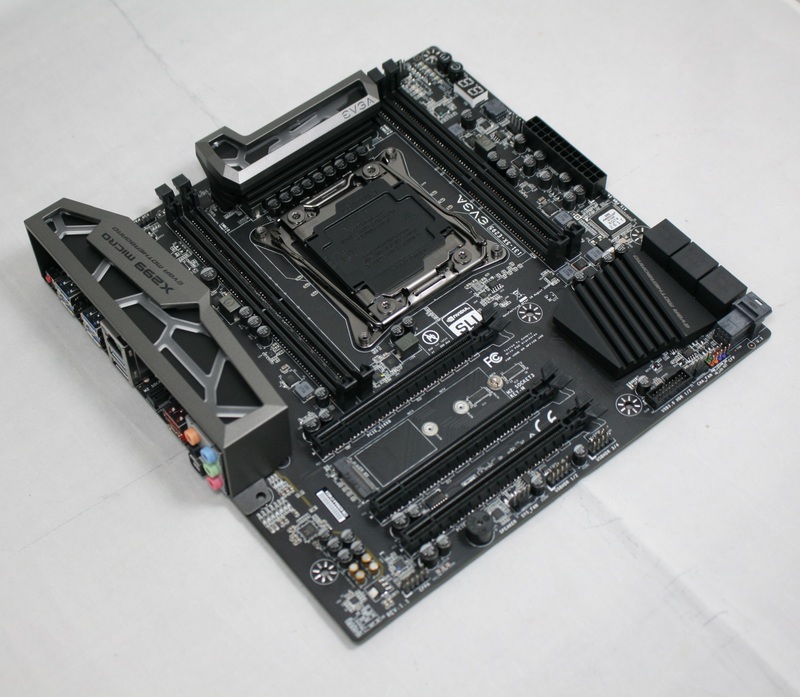 Unlike the FTW K, the shroud does not have RGB LEDs, nor does the power delivery heatsink. This is despite the specifications page on EVGA's website, which states it has them. For any user wishing to have RGB LED lighting, a strip will have to use the onboard header located in the top right corner next to the PWR_FAN. There is nothing that sticks out on the board in a positive or negative way for its looks. The Micro should be able to fit in well with most themes with the agnostic black color scheme. The EVGA X299 Micro has a total of six fan headers: the two CPU headers are located at the top right corner splitting the top of the right set of DRAM slots, and these are PWM controlled only. The remaining four headers are able to support both PWM and DC control. All headers can output a maximum of 1A (12W). This should be plenty for most, however many boards have at least a header or two which can distribute more power (for use with pumps or daisy chaining multiple fans on a header). EVGA advertises the the power delivery section on the board as 12-phases. The Vcore/VCCIN and VSA uses IR35201 and IR3556 MOSFETs, while the VCCIO uses IR 35204 and IR3556 MOSFETs. The bits for the CPU are rated to 50A and can supply up to 400W to the Vcore/VCCIN (8-phases for the CPU). Phase doubling duties are handled by the IR 3599 and is found on the back of the motherboard/VRM. This solution will hold up just fine to the rigors of high TDP CPUs with little fanfare. Sending power to the VRMs is a single 8-pin EPS 12V connector located just above the PWM area. 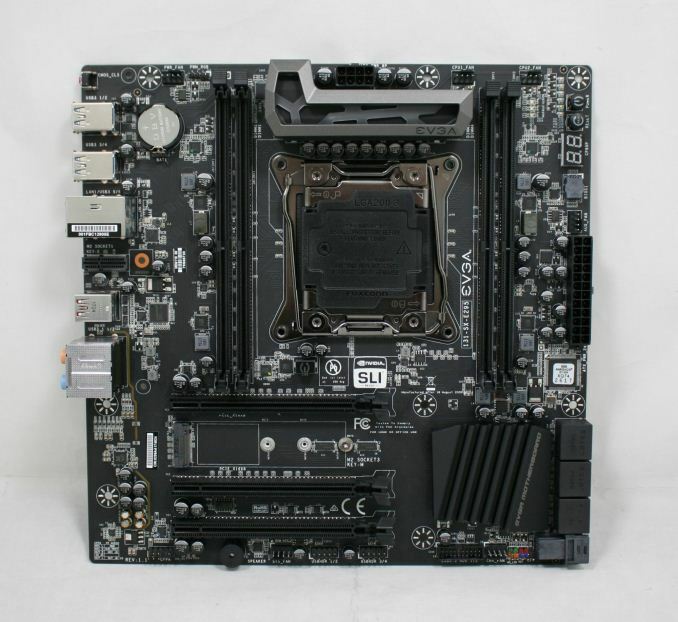 Being a microATX size board means some sacrifices will have to be made as there just isn't the same amount of real estate to go around. In this case, among other changes, EVGA chose to use four DRAM slots instead of the eight we normally see on this platform. To that end, memory capacity sits at 64GB on the Micro and it supports speeds up to DDR4-3600 using quad channel Skylake-X CPUs. If a Kaby Lake-X CPU is installed, supported speeds are higher at DDR-4133 but only two of the slots are active. 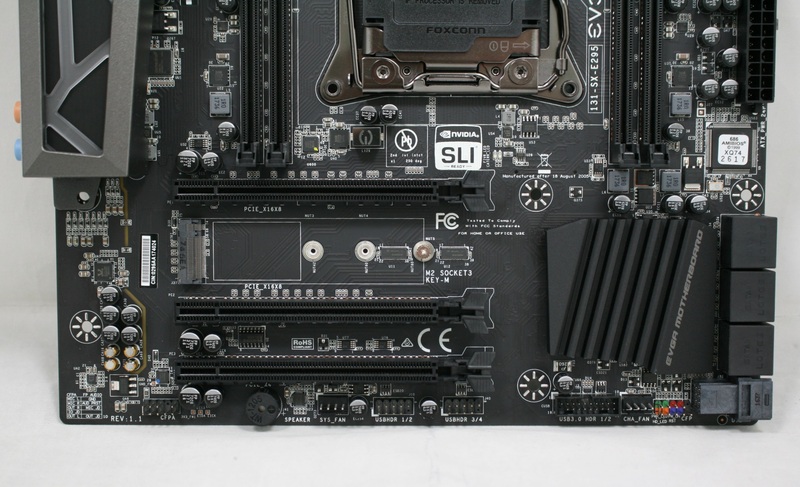 Focusing on the right side of the board, moving from bottom to top, we get the SATA and U.2 ports first, followed by the 24-pin ATX connector. Next, we can see the AUX_FAN header, the removable BIOS chip which sits next to the debug LED, power/reset buttons, as well as the voltage LEDs. Earlier we mentioned some sacrifices need to be made because of less real estate available, and here among the SATA ports is another area where that happened. 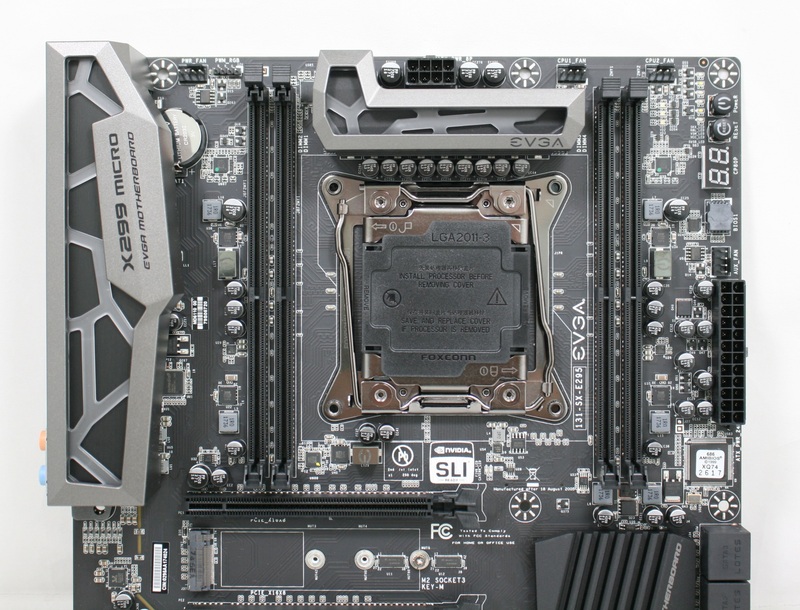 The X299 chipset is able to provide up to eight SATA ports, but here, due in part to space and part to the U.2 connector, we have a total of six. The bottom part of the board has the rest of the headers. On the left is the Front Panel HD Audio connector. Towards the middle of the board is the beep code speaker, a system fan header, and two USB 2.0 headers. To the right of it is a front panel USB 3.0 and chassis fan headers, and finally the front panel headers. 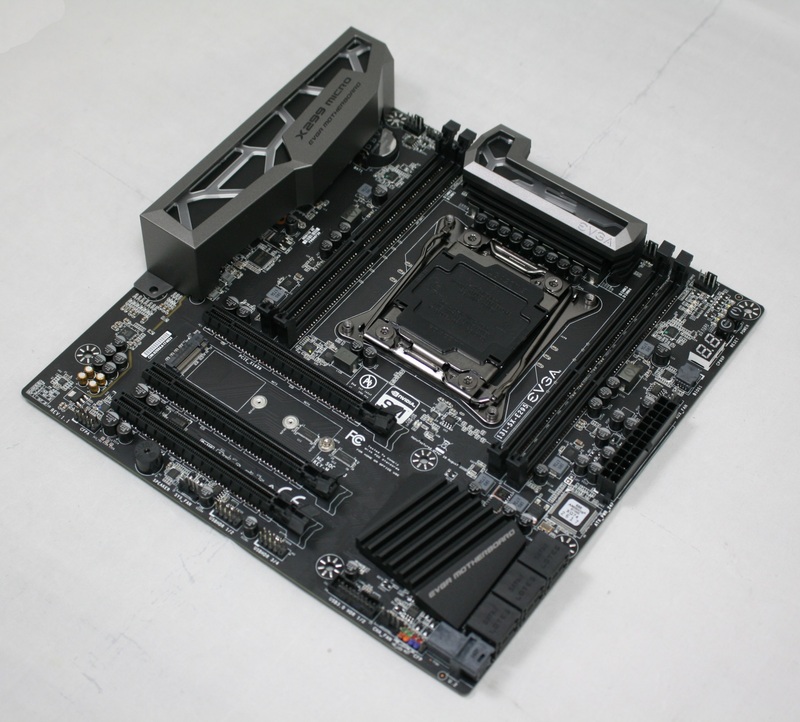 The PCIe part of the board consists of three full-length PCIe slots. The first two slots are attached to the CPU for x16/x16 operation (with 44-lane CPUs), while the bottom slot is from the chipset and runs at x4 speeds. Both the M.2 and U.2 slots are also connected via the chipset. What users might find interesting is the PCIe layout when a 16-lane CPU is in play. Because of the need to support all three sets of CPUs, EVGA has had to offer an x8/x8 configuraiton only with Kaby Lake-X, rather than x16/x0. 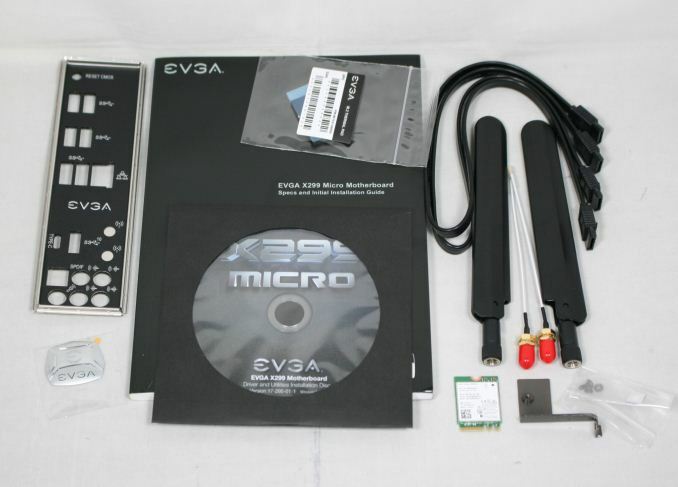 The EVGA Micro doesn't come with much, but does have what is needed to get started. Not pictured is the back panel shroud which does not come attached already, but is included. Also not attached, but pictured below, the Intel 8260NGW Wi-Fi module. This, curiously, also does not come attached to the board. If you want Wi-Fi capabilities, users will have to install the module yourself. "This showcases one of the downsides of a HEDT system: while other platforms (like Z170) were getting under 100 regularly, the additional featureset of these large platforms results in a higher DPC Latency."